The small village of Southwell may not be familiar, even for those who live Nottinghamshire. The village is most well-known for being home to one of the oldest cathedrals in England, most commonly known as the Southwell Minster. There has been a church on the site for over a thousand years and the current structure dates to the early thirteenth century. This stunning cathedral in the sleepy, rural Midlands is probably the best hidden of England's magnificent old cathedrals. The Dean of Southwell best describes a visit to the minster: 'This stunning place still brings visitors to their knees in wonder and awe to glimpse the glory of God ... enjoy its charm and peace'. 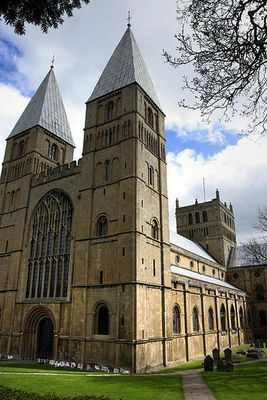 Southwell Minster. Photo by Andy Stephenson. Tours of Southwell Minster with a trained guide can be booked via Nikki Smith at nikki@southwellminster.org.uk or 01636 812649. Audio tours are also available for individual visitors to hire from the information desk. The grounds of the minster contain the ruins of the Archbishop's palace, which was destroyed during the English Civil War. Palace ruins. Photo by Erin Connelly. Apart from the beautiful architecture and quiet countryside, the daily Evensong services are a major reason to visit the minster. These approximately 45 minute services are composed of specially selected hymns and biblical readings. Although the tradition is Anglican, the Evensong services are open and welcoming to visitors of all backgrounds and traditions. 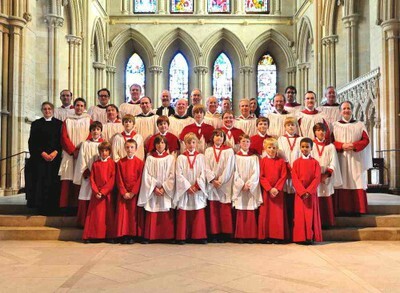 The minster has several acclaimed choirs, including the Cathedral Choir (men and boys), the Minster Girls' Choir, Boys' Voices, and the Minster Chorale (voluntary adult choir). The choirs share the Evensong services on alternating days during the week (schedule available at the official website). Evensong begins at 5.45pm Monday to Saturday and 3.00pm on Sunday. View from the top of the cathedral. Photo by Christine Hasman. The cathedral is also well-known for its illustrated and creative take on traditional services. In the past, the church has been decorated with relevant artwork from local artists during the Christmas and Easter seasons. During the lead-up to Easter the boys' choir sings to the village from the top of the cathedral, which is a favourite spectacle for both locals and tourists. 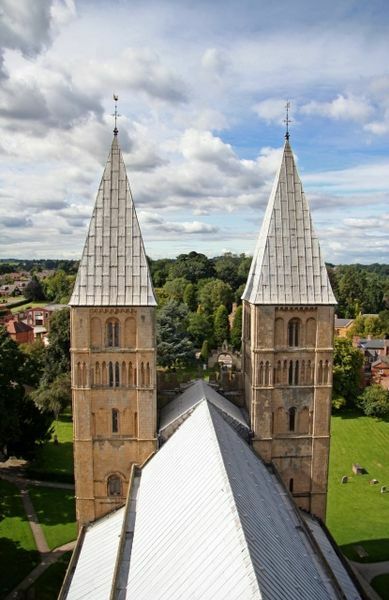 Only a few hours from London, a visit to Southwell can easily be combined with a trip to Nottingham city or a journey through the Peak District. An Evensong service in the peace and quiet of an ancient building is a particularly relaxing way to end a day of hiking in the peaks.